What’s up everyone!! 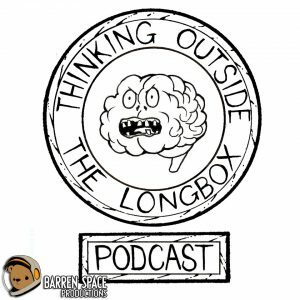 We’re coming to you straight from the hallowed walls of Gabe’s basement to bring you the 45 episode of Thinking Outside the Long Box!! Not only are we bringing you our latest opinions on the latest pop culture news, but we are also debuting, what Gabe has dubbed, the pop culture classics!! The whole middle segment of the show now revolves around 1 piece of literature or film that all three of us watch/read, and discuss. This episode we talk about Rafael Albuquerque’s comic book, Ei8ht! We give our opinions/thoughts, and read some feedback from others! Also, the first of two interviews comes from Mort Todd!! Mort is a comic book writer, and was the editor in chief for Cracked magazine! He has worked on MANY things, including; Back from the Grave, Marvel Music, Return of the Skyman, and MANY more!! Mort tells us about his awesome career, and the projects that he is working on right now!! Our second interview comes from the amazing Zander Cannon! Zander has worked on MANY different books, such as; The Chainsaw Vigilante, The Replacement God, Bone Sharps Cowboys and Thunder Lizards, and is currently working on KaijuMax! Who wouldn’t want to read a story about Kaiju in a super max prison!? Not only do we talk about that awesome book, but Zander tells us all about his rise to awesomeness!! You don’t want to miss it!